October 30, 2009 is a memorable date – 100 years ago Admiral Andrei Trofimovich Chabanenko was born. In 1931, after graduation from Frunze Naval School he served on Black Sea Fleet's submarines. In 1933 he was appointed submarine commander at Pacific Fleet; in 1938 Andrei Chabanenko became commander of PF submarine division and since 1940 till 1945 he headed PF submarine brigade. When WW2 was finished, Chabanenko was appointed commander of naval base in Sovetskaya Gavan. In 1946 he trained a course in Naval Academy and upon graduation was assigned to the post of Yuzhno Sakhalinsk naval base commander. In December 1947 he was drawn out to study in General Staff Military Academy and in April 1952 Vice Admiral Chabanenko was appointed Northern Fleet Commander. During his service in Northern Fleet, Andrei Chabanenko managed to create potent constructional base essential to speed up deployment of basing sites. He also developed submarine tactics in attack, search and recon screens and practically adopted it at exercises. Late 50-ies first Soviet nuclear-powered subs started to enter service. NF Commander headed first polar and distant cruises of submarines. Admiral Chabanenko himself often shipped out on surface ships and subs. In June 1962 he was assigned on the post of Assistant Chief of General Staff on naval issues. And 10 years later, in 1972 Andrei Chabanenko became to be consultant professor at General Staff Academy. In November 1976 he was retired and after ten years more – on December 19, 1986 – honored admiral had gone. But lifework of Andrei Trofimovich Chabanenko was successfully continued by his numerous followers. Moreover, Northern Fleet's large antisubmarine warfare ship Admiral Chabanenko called by media "ship of the XXI century" bravely serves at World Ocean to the benefit of our country. And if we talk about mysterious ligatures of marine fates, it is appropriate to state that the ASW ship's combat chronicles (including those not published before) are continuance of glorious biography of Andrei Trofimovich Chabanenko, his good deeds for the benefit of native land done at the time when Northern Fleet was becoming missile, nuclear and ocean-going. On March 10, 1999 Large ASW Ship Admiral Chabanenko was expected to moor at NF main base. Northern Fleet Commander Vice Admiral Vyacheslav Popov accompanied by heads of services and departments was staying on the pier. They were waiting for ASW to finish difficult interfleet cruise. "We've been waiting for you, subchasers", said Vice Admiral Popov at the meeting ceremony. "It so happed that building and commissioning of the ship delayed for almost ten years. But now you are at Northern Fleet after all. That is a remarkable and fortunate event for us!" 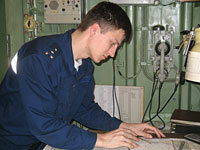 The ship's crew successfully passed Baltic straits in conditions of heavy traffic and sailed in North Sea on February 28. Appearance of new Russian warship in Baltic maritime zone aroused great interest of North European countries. Through hours the ship was escorted by vessels, patrol boats, aircrafts and helicopters of Germany, Denmark and Sweden. Dutch frigate showed special insistence. Its commander executed several maneuvers and shortened the distance between ships. 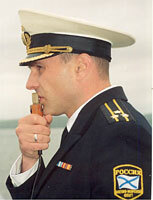 Vice Admiral Alexander Brazhnik, cruise commander and BF Chief-of-Staff immediately contacted frigate captain by radio and offered space for joint navigation. But the Dutch turned to be simply amazed of the Russian ship and wanted to take a chance to watch it more closely. "You guys have a wonderful and good-looking ship! We're envious of your luck", he said to Russian sailors and traditionally wished good speed in forthcoming cruise. By the way, that "kind envy" of the Dutch who taught naval skills no less a person than Peter the Great, was tremendously valuable for Navy. Designers, engineers, thousands of shipwrights (150 contracting plants and organizations) in complex economic conditions were literally fighting for Admiral Chabanenko. Sometimes employees of Kaliningrad shipyard Yantar who built the ship had to work without prepayment and even on credit, although they have not frozen the works. Alexander Solomatin, ship's main constructor and responsible for delivery had been living with the ship as a whole for 8 years! He spent days tackling something and persuading somebody. Admiral Vladimir Kuroedov being Navy Commander-in-Chief that time had been keeping final stage of works under personal control. It was obvious then – the game was worth the candle. Everybody witnessed new ship brightly acted at every phase of backfitting – it demonstrated excellent maneuverability, hit various targets by first round during artillery and missile firings. "As a ship's constructor and shipyard's representative, I' m very proud and glad that the work of thousands of people has been turned into reality and given into good hands. The crew obviously displayed skills and knowledge in controlling state-of-the-art equipment". However, there was no time to rest on laurels of first victory. Capt 1 rank Mikhail Kolyvushko and his subchasers started with first course task "K-1". Then they took the sea to execute "K-2". Those activities were intensive and in fast pace so in short time Admiral Chabanenko entered service in the fleet's constant readiness force and went on alert. Three years later, the ship sailed off for first ocean cruise after long period of coastal voyages. And two more weeks later, in August 2002, Northern Fleet's combat ships headed by Vice Admiral Vladimir Dobroskochenko, NF Deputy Commander started official visit to Republic of Iceland. The program of visiting Reykjavik was full of various protocol events, circular tours over the Land of ice, performances of Northern Fleet's actors and sport events. But the news that Icelandic President Olafur Ragnar Grimssom would visit ASW Admiral Chabanenko was absolute surprise for our sailors. The President of Iceland came to the Reykjavik quay on black Cadillac escorted by only one motorcyclist. Alexander Rannikh, Russian extraordinary and plenipotentiary ambassador to Iceland met the president at the ship's staircases and accompanied him on board. The important visitor was greeted at the heliport by Vice Admiral Vladimir Dobroskochenko, Northern Fleet Deputy Commander and Capt 2 rank Sergei Grishin, commander of ASW Admiral Chabanenko. In accordance with the protocol, Icelandic president accepted report of Capt Lt Sergei Lukashevich, commander of the honor guard. The orchestra played national anthems of Republic of Iceland and Russia to the accompaniment of twenty one salvos from saluting gun in honor of distinguished guest of the Russian ship. After inspection of Admiral Chabanenko, Olafur Ragnar Grimssom gave an interview to Krasnaya Zvezda and avowed that it had been a huge delight when he had visited Russia. That visit was the first in the history of two countries. Icelandic president expressed hope that Russian sailors should get to know his country better while out of duty. Moreover, NF mariners were expected to play a soccer game against Americal servicemen at NATO base Keflavik. And that confirms the world becoming better, said Grimsson. In Devonport base, Plymouth where Admiral Chabanenko called after Reykjavik, its visit was dated to Royal Navy Days. Except Russians, there were naval servicemen from Germany, France and Poland taking part in festivities. Navy Days are traditionally basic activity on presentation Royal Navy to public and its propaganda among civilian population. Therefore, about 70 thousands British and foreign tourists visited Devonport that time, 11 thousands of them got on board… Admiral Chabanenko. But not only rubbernecks climbed on board the Russian ship. That day among guests of Russian sailors were Vice Admiral Mark; commodores Rick Chidley and Anthony Ricks, commanders of Trafalgar-class nuclear submarines displayed at the event; command of frigate HMS Cornwall moored next to Admiral Chabanenko. Northern Fleet's ASW ship aroused genuine interest of helicopter pilots and marines. Even so-called language barrier could not hinder in talking and sharing views. As military interpreter Capt Tom Tarnowsky noticed, sailors always get each other right. Our sailors made warm welcome for delegates of British association "Russian Convoy" – hoar-headed participants of legendary Arctic "santons", and kids from Belarusian Bobruisk recreated at Plymouth outskirts on the initiative of British charity organization "Chernobyl Children's Life Line". Russian mariners showed Admiral Chabanenko to guests, entertained them at dinner in the mess-room, and presented memorable pennons and souvenirs. After such welcome all veterans confessed that they "couldn't dream about such a high privilege". Mischievous kids got acquainted with almost half the crew in an hour and with one voice declared: "We are happy to be on our ship and hear Russian language!" That's for sure – childish mentality is above the national diversity and state boundary. However, that's mighty good that ASW Admiral Chabanenko stuck in children's memory as only one but such a succinct word – "Our!" Russian sailors themselves were off like hot cakes during Navy Days. They went sightseeing to Plymouth and Exeter which are sister-cities to Russian Novorossiysk and Yaroslavl. The crew visited foreign ships at base, sailed on marines' assault boats, watched air show with Links, Sea King, Merlin helicopters and Sea Harrier deck-based attack aircrafts. Certainly, every Russian sailor was lavished with gifts, various booklets and posters about Royal Navy. Devonport's gift shops were abounded with those products. Basically, smiling Britishers just made gifts to our sailors and were unalterably admired by might and grace of statuesque Admiral Chabanenko's lines. One could hear everywhere: "Russian Navy's very good!" or "Russians? Hey, the devil is not so black!" Year later, in April 2003, large ASW ship Admiral Chabanenko under command of Vice Admiral Gennady Radzevsky sailed off Severomorsk and headed for Liverpool. Russian sailors were supposed to take part in celebration of 60th anniversary of battle for Atlantic. More than a day Admiral Chabanenko had not attracted attention of other states' recon services. Norwegian scout ship Maryata, coast guard vessels and even Orion base patrol aircraft of Norwegian Air Force ignored us. Only when returning to base, Orion briefly scanned our ASW by radar and flew to Andeya air base. Around two hours later a couple of F-16 Fighting Falcon fighters took off from Bodo air base. Their flight task was covert reaching the attack line, but "falcons" first flew in opposite direction – over continent, to Porsanger Fjord. We should give credit for teams of the ship's warning systems detected "pricks" of aircraft radars at maximum range. Falcons worked in active mode to "observe" the ship from long distance. After a while they reached the attack line Nord Cape – Medvezhiy Island. Probably, they counted on their unexpectedness. However, the subchaser was ready to meet any unfriendly motion towards itself by missile artillery. First and last out of ten runs made by F-16 over the ship simulated missile attacks. The rest flyovers resembled just a wish to demonstrate their power, said our sailors. Tellingly, the fighters had two fuel tanks under fuselages; that was meant for quite long-term flight. Unusual flight route over the country where plenty of civil aircrafts flew in air corridors and it was easy to get lost obviously accentuated intentions of F-16 pilots to reach Admiral Chabanenko from unexpected direction. Combat pods under Falcons were also surprising – normally, Norwegian aircrafts have only two Sidewinder air-to-air light missiles during flyovers. Though that time F-16 had an extra Sparrow air-to-air heavy missiles which have similar mass to Penguin antiship missiles. That was a first fly over Russian ship with such kind of combat load. The most impressive things to me in Liverpool were entries in the ship's guestbook. About five thousands of people visited Admiral Chabanenko during first three days. And even pouring rain and low clouds of the first day was not an obstacle for those who wanted to visit us. Guests were different – for example, kids from Clumber Lodge School were lavished with candies by our sailors; representatives of other navies came to the jubilee; town police and common residents of Liverpool. "When you sailed in River Mersey you passed by my house. That was amazing to see sailors drawn up on the top deck". But among crowds there were those who came on board by the call of memory. Moreover, by the sense of duty and infinite gratitude to Russian sailors. Austin Bern was heading for Murmansk in March 1942 in the convoy PQ-13 when his ship was torpedoed by German submarine. Only he and six crewmates escaped in the lifeboat. British sailors spent four days in stormy Barents Sea until they were picked up by Soviet minesweepers 125 miles north Murmansk. The veteran made an entry in the guestbook of Admiral Chabanenko: "...I'm very glad that I'm having a chance to thank for saving my life in 1942". "I had sailed in nine convoys, including screening patrol of notorious PQ-17. When we got the order to divide we hoped to attack German battleship Tirpitz, but it was not on the sea that time." Having had heard about the tragedy happened to vessels separated from the convoy PQ-17 and attacked by German subs and aircraft from "wolf packs", Don and other sailors had no right to return and save their companions. The order was to sail only toward Soviet lands, to Murmansk and Arkhangelsk. "We enjoyed a huge delight visiting the ship; we were greatly impressed by friendliness and respect of your sailors. Please, enjoy staying here as we enjoyed visiting your ship..."
The joint Russian-French naval exercise held in September 2004 in the northeast Atlantic. Northern Fleet's tactical task force consisting of Large ASW Ship Admiral Chabanenko and SSBN Vepr took part in it. French Navy was represented by SSBN Emerald (Rubis-class) and guided missile destroyer Tourville. Main objective of the exercise was to work out elements of forthcoming "Agreement between governments of the Russian Federation and French Republic on secure navigation of submarines beyond the territorial waters". The exercise lasted a week and included five stages. To reach meeting point with French ships in the Atlantic 100 miles south Iceland coast, Northern Fleet's task unit performed 2,300-mile cruise marked with nasty weather and force-eight storms. By the way, international task force covered about 1,500 marine miles during the exercise and executed practically dozens of elements provided in Russian-French agreement. When the mission was successfully completed, Large ASW Ship Admiral Chabanenko and SSBN Vepr called at French port Brest. That was the first-ever Russian nuclear submarine visiting NATO country. December 2008, at last. Joint Russian-Venezuelan naval exercise VENRUS-2008 – first-ever in both countries' history again – held in Caribbean Sea. The tasks of joint tactical maneuvering in line were worked out during the exercise, both under control from Russian and Venezuelan ships. The matters of search operations using Ka-27 helicopters of NF task unit were also trained, including deck landing of search teams; rendering of help to ship in distress; flight operations using Su-30MK Venezuelan Air Force aircrafts; elements of air defense exercise. Much prominence at VENRUS-2008 was given to elaboration of sea interaction on cargo exchange while replenishment of Venezuelan frigate's supplies by Russian tanker. Russian Navy sent four NF ships to conduct the exercise: BCGN Pyotr Veliky, large ASW ship Admiral Chabanenko, large ocean-going tanker Ivan Bubnov and rescue tug SB-406; they sailed off Severomorsk as early as September 22, 2008. For its part, Venezuelan Navy sent eleven ships to the exercise area, including frigates ARV Mariscal Sukre, ARV Almirante Brion and ARV General Soublett and eight naval aircrafts as well. As is known, Venezuela met Russian ships with friendly vivas, drumbeat and salute. BCGN Pyotr Veliky anchored off La Guaira Port and ASW Admiral Chabanenko moored at the quay. At the beginning of visit, the subchaser commanded by Capt 1 rank Anatoly Dolgov was visited by presidents of Russia and Venezuela Dmitry Medvedev and Hugo Chavez. Saluting gun fired 21 times for each president in honor of distinguished guests arrived on board. Honor guard met heads of the states at the ASW ship. The President of Russia Dmitry Medvedev and the President of Venezuela Hugo Chavez accompanied by Capt 1 rank Anatoly Dolgov viewed Admiral Chabanenko and got acquainted with its design and unique armament. During their visit, heads of the states discussed matters of further development and strengthening of positive partnership between Russia and Venezuela in naval sphere. Moreover, Hugo Chavez liked Admiral Chabanenko so much that Venezuelan leader spent much more time on it that it was provided by the protocol. The distant cruise of Admiral Chabanenko continued long time after Venezuela. By the way, late January 2009 the ship with its successful combat training at sea celebrated 10th anniversary of St. Andrew's flag appeared over it! Those were just a few remarks to rich and protean biography of the large antisubmarine warfare ship named after Admiral Chabanenko ruled Northern Fleet since 1952 till 1962. 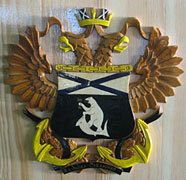 What is more it is a street in Severomorsk named after Andrei Trofimovich in November 1990. It cannot be denied, to have individual ship and street is a great privilege! And of course, grateful memory of descendants for the good deeds done – warrior's and temporal. Indeed, that was initiative of Admiral Andrei Chabanenko to increase duration and range of cruises, to pay visits of NF mariners to Sweden and Norwegian ports. In September 1955 it was the world's first test launch of ballistic missile from submarine in the White Sea; and Northern Fleet was the fist to commission B-67 submarine (armed with ballistic missiles) in June 1956. On July 1, 1958 the Navy flag was hoisted at the first Soviet nuclear submarine K-3 (named Leninskiy Komsomol afterwards) and on April 10, 1959 SSBN K-3 entered service in Northern Fleet. In September 1960 it was the world's first underwater launch of ballistic missile from B-67 submarine commanded by Capt 2 rank Vadim Korobov. On July 17, 1962 having performed cruise under Arctic ice, SSBN Leninskiy Komsomol was first in history to break surface at the North Pole where its crew planted national flag of the USSR and Navy flag. And all those glorious pages of our Navy's chronicles were written while Admiral Chabanenko was Northern Fleet Commander. Besides, during the years when Andrei Trofimovich was the fleet commander, they built in Severomorsk Navy Officers' Club, comfortable swimming pool, first in Kola region widescreen cinema "Rossiya", military polyclinic and city hospital. In 1956 the Zagorodny Park was established on his initiative. So, Andrei Trofimovich made a great personal contribution to strengthening defense capacity and national security of our country and to life improvement of sailors serving in severe conditions of Polar region. His name lives in memory of those who gave decades for Northern Fleet. And now his deeds are worthily continued by the crew of Large ASW Ship Admiral Chabanenko.